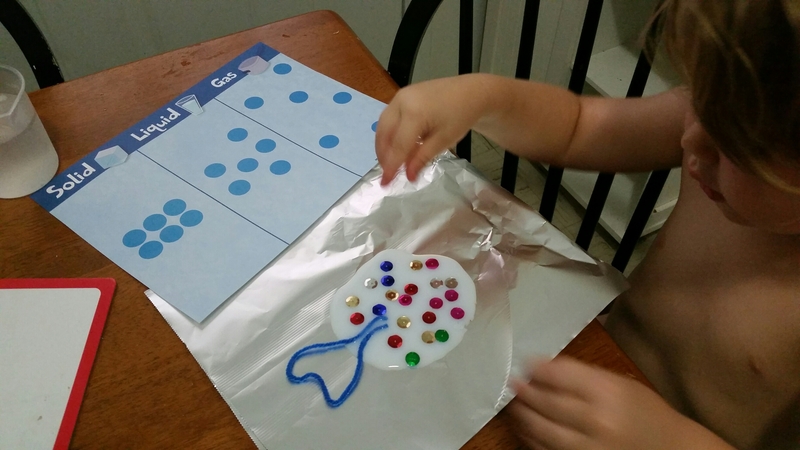 Presenting science to a preschooler can be a daunting task. Science is pretty obscure with a lot of complex concepts, right? Well luck for me I have Mother Goose Time (our fabulous preschool curriculum) to do all of the hard work for me! Today we discussed states of matter: solid, liquid and gas. Our first example was water, and how under different conditions it can be solid (ice), liquid (water) or gas (steam). This was a huge hit because let’s be honest, what kid doesn’t love to play with water and ice?!? Our first project today was a quick and fun study on how things can change from one state to another. We decorated a blob of glue and discussed what would happen to the glue after sitting out. X decided it would dry and become a solid. We’re still waiting for it to dry, but he’s very excited to see if his hypothesis is correct! X’s favorite project of the day was a recipe! We took cream (liquid) and put it in a jar. I asked if he thought we could turn it into a solid. He did not. But after a few fun and silly minutes of counting and shaking we made it into a thick (and delicious!) whipped cream! Adorned with some fresh berries and it was a great snack to wrap our school for the day! Yum! You really can’t beat science you can eat! 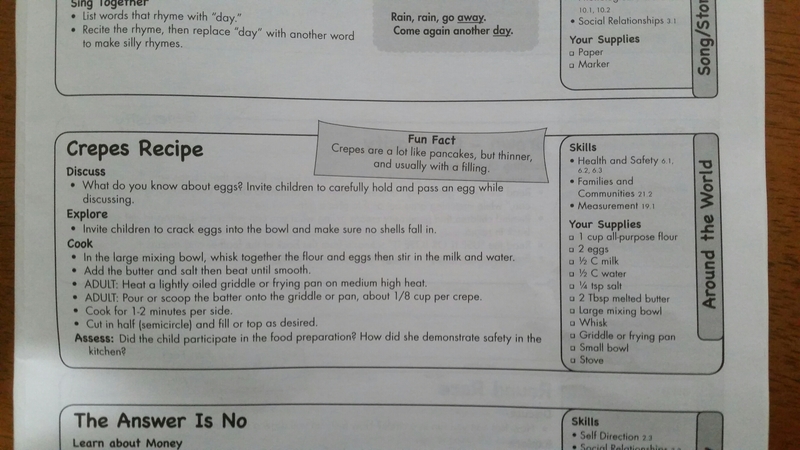 I really enjoy how Mother Goose Time includes two or more recipes each month. It reminds me the importance of getting X in the kitchen AND gives us a fun and simple recipe to do together. They really get creative and go beyond my go to’s like having him peel eggs or chop vegetables. When we were discussing Italian artists we recieved a neat recipe for spaghetti sauce. I put whole stewed tomatoes in a zip top bag and X squished them until they were all broken up. This was great for working his hand muscles (hand strength is an important first step to writing)! I took it a step further and had him rip up basil leaves to sprinkle on top. Mother Goose Time recipes always keep it simple and healthy. I almost always have all the ingredients on hand. This week we’ve been studying French artists. 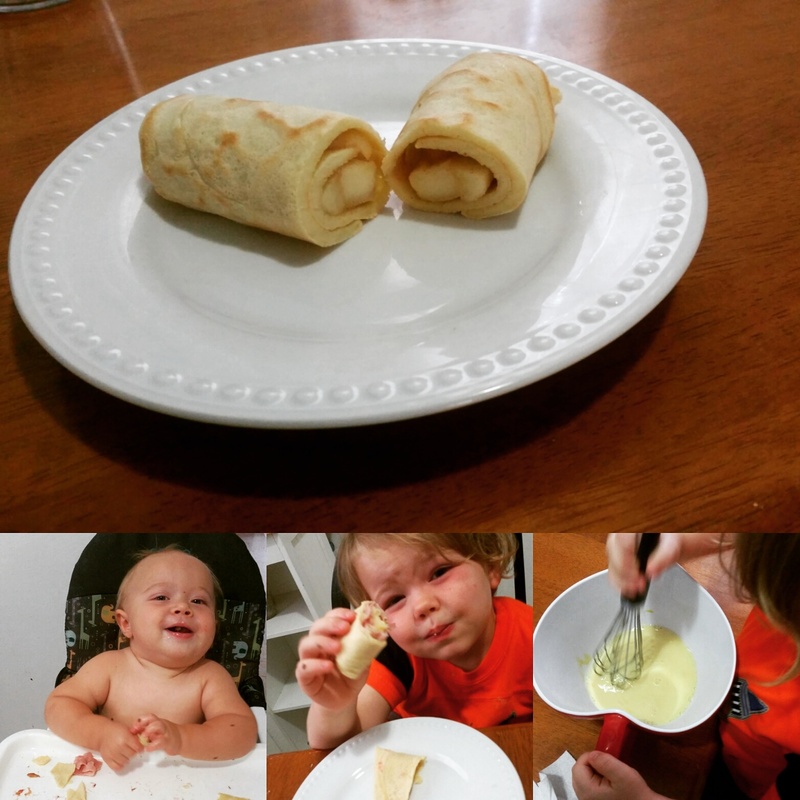 Today our recipe was crepes! Crepes are thin, egg pancakes that can contain sweet or savory fillings. X cracked the eggs, measured and poured the ingredients and mixed it all up. He was working on hand strength, hand eye coordination, math and building focus. I cooked them and rolled them up with ham and cheese. We made dessert with the leftover crepes by filling them with fried cinnamon apples. It was a fun recipe to whip up together and since they only need to cook for 1-2 minutes per side, they were also quick! X was so proud to help make a lunch that we all really enjoyed. Here’s a peek at the recipe if you’d like to try these tasty treats with your kids! X is not a picky eater, I’m lucky (so far, fingers crossed). He’ll eat a pile of asparagus, onions, olives, broccoli, you name it, he eats it. He even prefers probiotic rich homemade sauerkraut over just about anything… But all kids could eat more veggies, proteins and healthy fats. I struggle with what to feed X for breakfast and often times lunch. Usually he eats what we eat, but I don’t eat breakfast generally during the week and I don’t always have time to make him an eggs and veggie scramble. So he eats frozen waffles fairly often. Organic frozen waffles with blueberries, but frozen waffles none the less. He eats animal crackers and cheese crackers… Also organic, but I think I’ve pulled the veil over my own eyes, just because they’re organic, doesn’t mean they’re healthy. And just because they’re quick and easy, doesn’t mean it’s a good choice. Daddy and I have been following a Paleo style eating plan for the past two weeks (I had great success with primal eating while he was deployed) which has improved the quality of our family meals. Honestly, X was grain and sugar free until his molars came in. Which was a choice I was adamant about after reading about how our bodies do not produce the proper enzymes to digest grains until after molars (which makes sense because dehydrated, ground up baby cereal wasn’t around in the cave days). How did I stray so far from the ideals I’ve upheld his whole life? Well, toddlers have opinions. He doesn’t like the consistency of applesauce or anything squishy, he wants to eat what we eat… Children are born with an ingrained knowledge of what a cookie is, I swear! 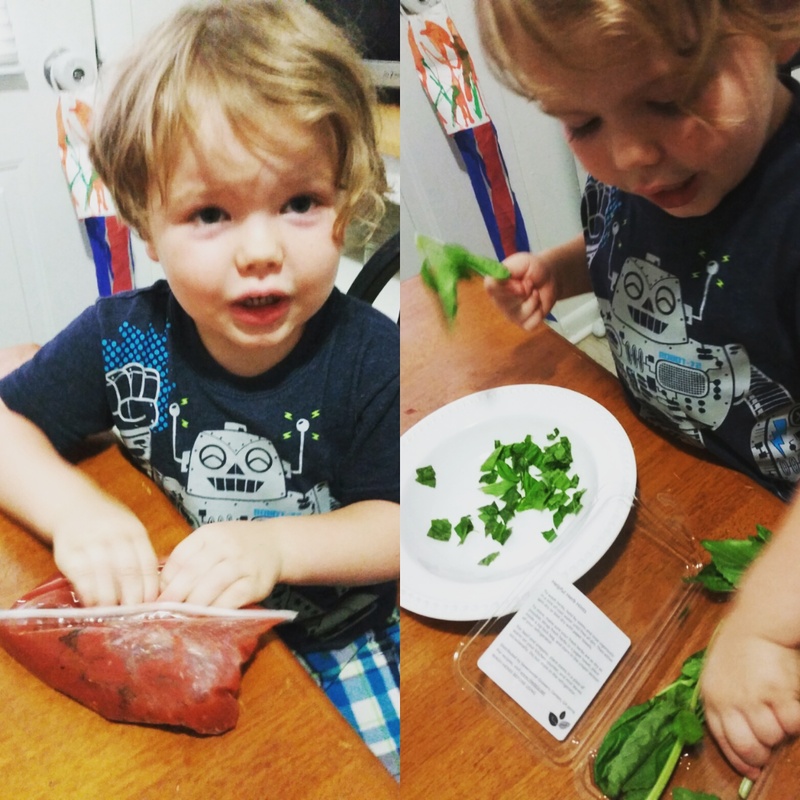 Honestly cooking fun and cute meals for a toddler was one of the things I was greatly looking forward to in having children. But then we moved, and then I unpacked, and then we were on vacation and then Daddy and I started eating Paleo (which is easy, but takes planning) annnnnd the list of excuses could go on. But today that’s changing. 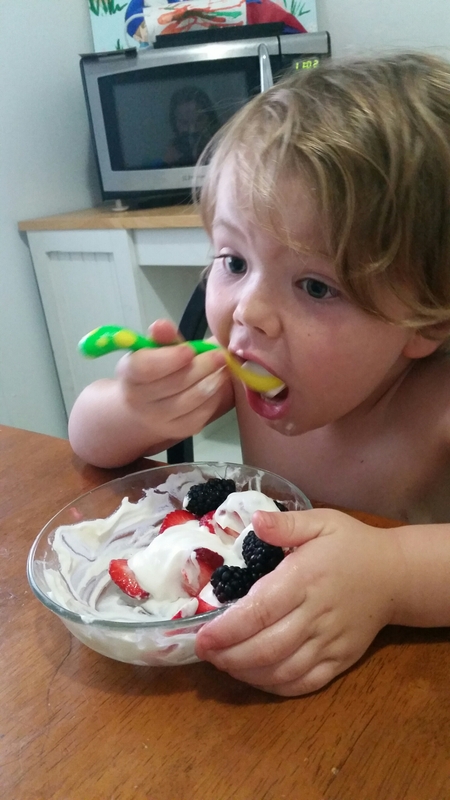 Today I’m committing to creating healthy, delicious, fun recipes for toddlers. And will make life a little easier for myself along the way. So come and join the ride! Today I’m making mini pumpkin pancakes filled with power foods: coconut, pumpkin, molasses… yum! They’re also grain free, sugar free and dairy free; have a good amount of protein, potassium, iron, calcium and vitamin A! I’m making a batch to throw in the freezer. Not QUITE as easy as store bought waffles, but pretty close and WAY healthier. These are also paleo and by no means are they just “kid food” whip up a batch for the whole family! I used a cookie scoop so I could get consistent, round, small pancakes. It worked really well for me. This is a small batch recipe. We’re cooking for toddlers here, remember? This made 15 silver dollar pancakes for me. X will only eat 2 at a time (I serve with fruit and nuts), so this is 7 days worth of breakfast for him. It would probably be plenty for two adults and one toddler if you’re whipping these up over the weekend. The pairings for these are endless. Almond butter and honey; blueberries and jam; nuts and honey; tried and true maple syrup… Get creative! If you come up with some super yummy combos, let me know! ~Combine all of the dry ingredients, mixing well. ~Separately combine all wet ingredients, mixing well. ~Add dry to wet and incorporate. ~Heat additional coconut oil in a nonstick skillet over Medium Low (keep the heat low so the sugars in the molasses doesn’t cause them to burn). ~Scoop batter and flatten out slightly. ~Flip once they start to hold together. ~Leftovers can be frozen and reheated in the broiler or toaster oven.